The Primal Root here, and man, I just can’t get into the Halloween spirit this year! It just feels as if I’ve seen every Halloween themed horror movie out there a million times! 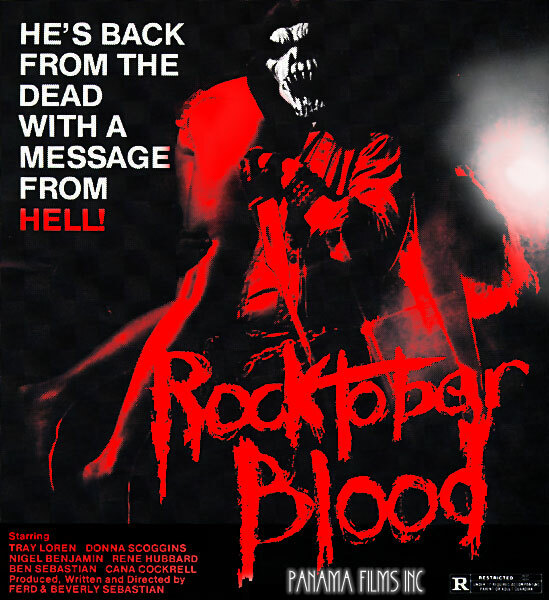 Just sitting here at Video 21 waiting to close down for the night, contemplating going Trick or Treating, when some last minute customers barge in and all of a sudden I find myself face to face with just piece of Trash Cinema I had been hoping for: Rocktober Blood. Rocktober Blood is an inept, blood soaked, hair metal epic! Featuring some of the worst acting I’ve ever witnessed, poor production values, terrible editing and some genuinely catchy cheesy 80’s metal tunes. Plenty of murder, mayhem, plot twists, brain hemorrhaging reveals, 30 minute long bathing sequences and one incredible finale that takes place during the now LEGENDARY Rocktober Blood Concert of 1984. So join me, your host The Primal Root, and get into the Halloween spirit as we check out one of the strangest, goofiest and trashiest films from the VHS era! Join me for a heaping helping of, Rocktober Blood! And a VERY Special Thanks to Kevin Johnson of Celluloid Cesspool for not only introducing us to Rocktober Blood bot for sending us his personal copy which made this Rotten Review possible. Many thank, my friend! Stay Trashy and have a Happy Halloween!